During Metallurgical Sample preparation, polishing is very primary-After polishing grinded samples, we can get very bright surface like mirror. Collecting many customers’ suggestions, PG-1A was designed. PG-1A operates steadily in low noise, and easily to use and maintain. The size of the polishing wheel and the transmission power are bigger. PG-1 adjusts to all kinds of materials polishing work. PG-1A is equipped with polishing water supply system. 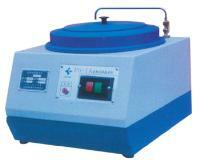 PG-1A is the ideal equipment for metallurgical sample polishing.